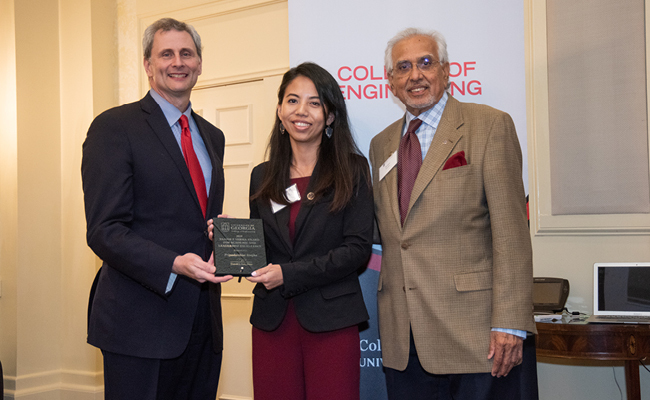 The University of Georgia College of Engineering honored outstanding students, faculty and staff during the College’s 2019 Celebration of Excellence April 2. The College presented academic awards to undergraduate and graduate students and recognized faculty for exceptional instruction and research during the ceremony at the Athens Country Club. The College presented its Award for Excellence in Research to Jason Locklin, a professor in the School of Chemical, Materials and Biomedical Engineering. Locklin leads a team of researchers working to develop sustainable materials that can be used in a variety of commercial applications, including the development of new compostable paper coatings and biodegradable drinking straws. Thomas Lawrence received the Award for Excellence in Instruction. Lawrence, a professor of practice in the School of Environmental, Civil, Agricultural and Mechanical Engineering, has consistently worked to develop new, innovative programs that provide a breadth of experiential learning opportunities to students. He played a pivotal role in the creation and management of the college’s engineering and German dual degree program. He was also instrumental in the planning and implementation of the college’s Bachelor of Science in Mechanical Engineering program. Associate Professor Sung-Hee “Sonny” Kim was named Distinguished Faculty Fellow in recognition of his excellence in scholarship and the development of a robust and growing research program. Since joining the UGA College of Engineering in 2016, Kim has led the development of student-centered and experiential-based civil engineering courses that produce practice-ready engineers. In addition, his applied research has been translated into innovative practices in pavement design and maintenance. In addition to receiving the Award for Excellence in Research, Jason Locklin was named a Distinguished Faculty Scholar in recognition of his sustained excellence in scholarship. Locklin’s research group is active in a variety of areas related to polymer science, polymer processing, and surface and interfacial modification. During his career, he has published more than 100 peer-reviewed studies in high-impact journals and his research has attracted funding from a variety of funding agencies as well as private industry. He is the founding director of the New Materials Institute and he leads the National Science Foundation IUCRC site for the Center of Bioplastics and Biocomposites. The College presented its Staff Award for Excellence to Paul Bowles, an instructional technology professional specialist. Bowles joined the UGA department of biological and agricultural engineering in 2001 and for a time was the only IT professional supporting engineering faculty, staff and students. He now coordinates all software maintenance and license compliance and handles all IT software and equipment purchases in the College. In addition, the College recognized faculty members and student researchers for intellectual property discoveries in 2018 including U.S. patents and start-up companies. Mable Fok, Ryan Toole, Ramaraja Ramasamy, Changying “Charlie” Li, Rui Xu, James Kastner, Maryan Pirmoradi, Leidong Mao, Mark Eiteman, TaoTao Zhu, Melissa Tumen-Velasquez, Yajun Yan, and Jason Locklin all earned patents for their discoveries. Jenna Jambeck, an associate professor, and Katherine Shayne, a research assistant, launched Can I Recycle This, Inc., a social media app that uses artificial intelligence to improve recycling efficiency by helping users determine if an item is recyclable in their communities. Peter Kner, an associate professor, started a company named TelePet, LLC. TelePet is a portable electroencephalogram (EEG) monitor that tracks and predicts epileptic activity in cats and dogs without the need for anesthesia or sedation. Hitesh Handa, an assistant professor, created inNOveta Biomedical, LLC as an extension of his research into the development of biocompatible materials and coatings for implantable medical devices and wound dressings. Other awards presented during the event include awards for the top undergraduate student in each of the College's academic departments, as well as college-wide student awards. Andrea Duncan, a senior mechanical engineering major, received the Undergraduate Merit Award for Service. Duncan has been heavily involved in the life of the College of Engineering in a number of ways, including serving as a College Ambassador and as president of the student chapter of the National Society of Black Engineers. She also volunteered as a tutor and mentor in Clarke County’s public schools. The Undergraduate Merit Award for Research was presented to Dieu Thao Nguyen. Nguyen, who graduates this year with a Bachelor’s Degree in Biological Engineering, has conducted research under the mentorship of Assistant Professor Hitesh Handa for three and a half years. Her work in microbiology, cell and tissue engineering, molecular biology, and wound healing has led to two CURO assistantships, a CURO fellowship, a patent, one publication, and two pending publications. The College honored Jackson Harris, a member of the UGA football team, with the Undergraduate Merit Award for Athletics. Harris will graduate in May with a Bachelor's of Science in Mechanical Engineering. He was a semifinalist for the Campbell Trophy, presented each year to the nation's top football-scholar athlete. Harris is also an active volunteer with Extra Special People, a local service organization for people with developmental disabilities. The College also presented awards to incoming undergraduate students during the ceremony. The Dean’s Award for Excellence in Early Student Achievement recognizes students who have the highest ranked academic credentials at the time they are admitted to their major. This year’s recipients are William Howard Ledford (Biological Engineering) and Haley Selsor (Agricultural Engineering). The Chair’s Award for Excellence – Best Personal Statement is presented to a student in each of the College’s three schools in recognition of their high quality of the student’s personal statement submitted for application to their major. The recipients of this year’s Chair’s Awards are Megan Williams (School of Chemical, Mechanical and Biomedical Engineering), Ulises Trejo-Torres (School of Electrical and Computer Engineering), and Thomas Spoerer (School of Environmental, Civil, Agricultural and Mechanical Engineering). Two students, Avery Rogers and Melanie Plummer, were honored with the Caswell Student Challenge Award. The award recognizes undergraduates studying biological and/or agricultural engineering who have earned Dean’s List designation while maintaining a grade point average of at least 3.9. Undergraduate Awards for Academic Excellence, which recognize one senior student from each degree program, were presented to students who have demonstrated exemplary performance in upper-level engineering coursework. The College recognized outstanding graduate students with awards for their research and service. Priya Singha received the Brahm P. Verma Award for Academic and Leadership Excellence. A research assistant and doctoral candidate in biological engineering, Singha has excelled in research in the fields of biopharmaceuticals, polymer chemistry, and biomedical engineering. In 2018, she was one of only six graduate students nationwide to receive a Baxter Young Investigator Award. He work has resulted in the publication of five peer-reviewed papers in high-impact scientific journals and two filed U.S. patents pending. The Award for Excellence in Graduate Student Teaching was presented to Ryan Devine. The award recognizes a graduate student who has demonstrated superior teaching skills and commitment to high-quality instruction. The College recognized graduate students for the quality of their published research, collaboration with other research groups, and mentoring of undergraduate students involved in their research. Awards for Excellence in Graduate Research were presented to Priya Singha, Qidi Liu, Amy Brooks, and Matthew Becton. In addition, the College honored faculty and staff for milestones in their years of service: Troy Butler (facilities, 30 years), Tim Foutz (professor, 30 years), Sarah Lee (research technician, 25 years), Jarrod Buffington (administrative financial director, 20 years), James Kastner (associate professor, 20 years), David Stooksbury (associate professor, 20 years), Hillary Tanner (senior lecturer, 20 years), Thomas Lawrence (professor of practice, 15 years), Kyle Johnsen (associate professor, 10 years), Peter Kner (associate professor, 10 years), and Joachim Walther (associate professor, 10 years).